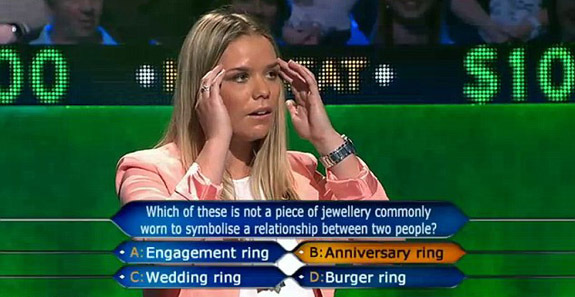 Competing to win a fortune on Australia’s version of “Who Wants to Be a Millionaire,” tour manager Whitney Beseler stunned a national audience and host Eddie McGuire when she flubbed the simple $100 question — mistaking a snack food for a romantic jewelry keepsake. Fans of “Who Wants to Be a Millionaire” know that the $100 question is often so simple that even a small child could answer it. 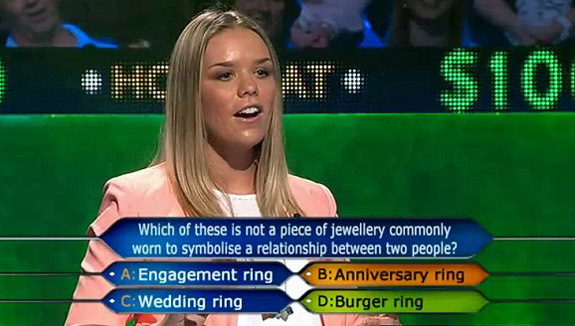 In this case, the available answers were "A: Engagement Ring;" "B: Anniversary Ring;" "C: Wedding Ring;" or "D: Burger Ring." 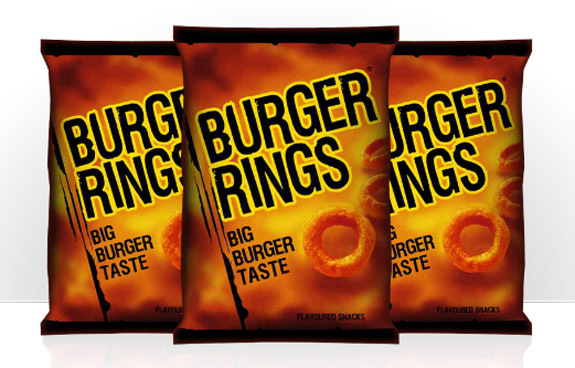 What should have made the answer so obvious is that the fact that Burger Rings are a wildly popular burger-flavored, onion-ring-shaped snack food with a devoted following throughout Australia and New Zealand. When the studio audience gasped, McGuire asked Beseler to have another look at the options, hoping the young woman would recognize and correct her embarrassing mistake. But, Beseler confidently locked in her original answer. But a redo was not in the cards. Later in the show, the host brought Beseler back onto the set to offer her a rare consolation prize: a bag of Burger Rings. More than one million YouTube viewers have seen the video of Beseler’s nightmarish appearance of “Millionaire.” Beseler has become an instant worldwide celebrity, but not in a positive way. She’s been the target of a relentless barrage of cruel and unflattering comments on social media. The former physical education teacher told an Australian television station that the harsh criticism has inspired her to turn this experience into a way of educating and helping children understand and deal with bullying. She acknowledged that the Burger Ring incident on “Millionaire” will be following her for a long time. "If my future [fiancé] doesn't propose to me with a Burger Ring, he's obviously got no sense no humor," she told 9News. 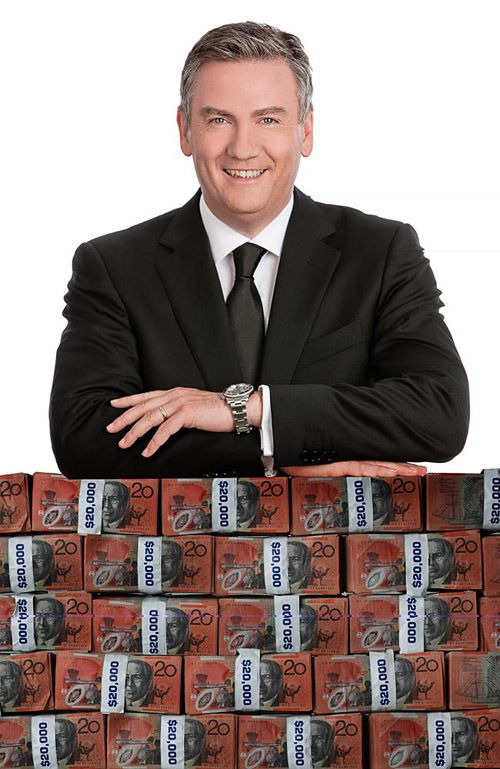 Check out Beseler’s viral appearance on “Millionaire,” below. 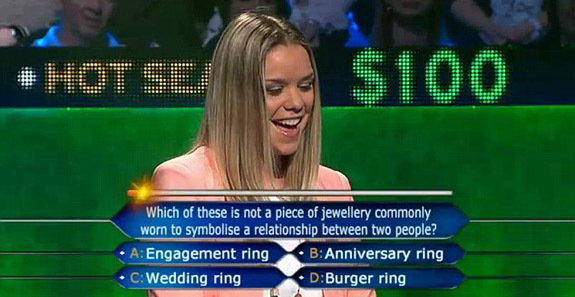 "Who Wants to Be a Millionaire" screen shots: Channel9; "Who Wants to Be a Millionaire" promo image: Supplied; Jewelry images: Stuller.com; Burger Rings images: Supplied.